At the 2007 Academy Awards® ceremony, an unprecedented number of Black performers received acting nominations, and two of the statues awarded that evening went to Forest Whitaker and Jennifer Hudson. Indeed, since 2000, more African Americans have received Oscars than in the previous century. While the last few years have seen more and more Black performers receive acknowledgment by the Academy, it hasn't always been that way. African Americans and the Oscar®: Decades of Struggle and Achievement highlights the advancements Black performers have made on the silver screen and how those performances were honored by the Academy. In the Academy's first 40 years, less than ten African Americans were cited for their work on screen and only two, Hattie McDaniel and Sidney Poitier, received competitive awards before the 1980s. This book profiles all the nominees and recipients of the coveted award in the acting, writing, and directing categories, beginning with the first: McDaniel's Best Supporting Actress win for her role in Gone with the Wind (1939). Each entry, organized chronologically and by name, provides valuable information about how the role or film was viewed during its time and also places it in historical context by drawing connections to other related awards or events in film history. In the introduction, Mapp's overview of the nomination process helps explain the historically low percentage of African Americans who have been nominated or received the honor. Also, appendixes provide lists of non-acting/directing nominees and winners, overlooked performances, and performers of nominated songs. 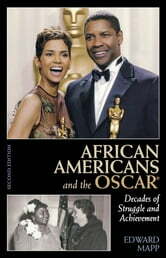 Highlighting the achievements of Sidney Poitier, Whoopi Goldberg, Halle Berry, Morgan Freeman, Spike Lee, Jamie Foxx, Denzel Washington and others, this volume provides an enlightening history of the Black experience in Hollywood and will fascinate fans of all ages.